For NCAA Division II, see NCAA Division II Baseball Championship. For NCAA Division III, see NCAA Division III Baseball Championship. For the women's softball championship, see Women's College World Series. The College World Series, or CWS, is an annual baseball tournament held in Omaha, Nebraska that takes place in June of each year. The CWS is the culmination of the NCAA Division I Baseball Championship series which determines the NCAA Division I college baseball champion. The eight participating teams are split into two, four-team, double-elimination brackets with the winners of each bracket playing in a best-of-three championship series. Since 1950, the College World Series (CWS) has been held in Omaha, Nebraska. It was held at Rosenblatt Stadium from 1950 through 2010; starting in 2011, it has been held at TD Ameritrade Park Omaha. Earlier tournaments were held at Hyames Field in Kalamazoo, Michigan (1947–48) and Wichita, Kansas (1949). The name "College World Series" (CWS) is derived from that of the Major League Baseball World Series championship; it is currently an MLB trademark licensed to the NCAA. On June 10, 2009, the NCAA and College World Series of Omaha, Inc., which is the non-profit group that organizes the event, announced a new 25-year contract extension, keeping the CWS in Omaha through 2035. A memorandum of understanding had been reached by all parties on April 30. The currently binding contract began in 2011, the same year the tournament moved from Johnny Rosenblatt Stadium to TD Ameritrade Park Omaha, a new ballpark across from CenturyLink Center Omaha. 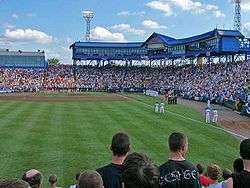 2006 College World Series Championship game at Rosenblatt Stadium in Omaha, Nebraska. 1947 – Eight teams were divided into two, four-team, single-elimination playoffs. The two winners then met in a best-of-three final in Kalamazoo, Michigan. 1948 – Similar to 1947, but the two, four-team playoffs were changed to double-elimination tournaments. Again in the finals, the two winners met in a best-of-three format in Kalamazoo. 1949 – The final was expanded to a four-team, double-elimination format and the site changed to Wichita, Kansas. Eight teams began the playoffs with the four finalists decided by a best-of-three district format. 1950–1987 – An eight-team, double-elimination format for the College World Series coincided with the move to Omaha in 1950. 1950–1953, a baseball committee chose one team from each of the eight NCAA districts to compete at the CWS. Through 1987 the College World Series was a pure double-elimination event. That ended with the 1987 College World Series. 1988–1998 – The format was changed beginning with the 1988 College World Series, when the tournament was divided into two four-team double-elimination brackets, with the survivors of each bracket playing in a single championship game. The single-game championship was designed for network television, with the final game on CBS on a Saturday afternoon. Before expanding to 64 teams in 1999, the Division I tournament began with 48 teams, split into 8 six-team regionals. The winner of each regional advanced to the College World Series. The regionals were a test of endurance, as teams had to win at least four games over four days, sometimes five if a team dropped into the loser's bracket, placing a premium on pitching. In the last two years of the six-team regional format, the eventual CWS champion – LSU in 1997 and Southern California in 1998 – had to battle back from the loser's bracket in the regional to advance to Omaha. 1999–2002 – With some 293 Division I teams playing, the NCAA expanded the overall tournament to a 64-team Regional field in 1999, with 8 National Seed teams, divided into 16 four-team regionals (each region seeded 1 to 4). The winners of each of the 16 "Regionals" advanced to 8 two-team, best-of-three-format "Super Regionals". The 8 Super Regional winners advanced to the CWS in Omaha. While the CWS format remained the same, the expanded field meant that eight Super Regional champions would advance. The 64-team bracket is set at the beginning of the championship and teams are not reseeded for the CWS. Since the 1999 College World Series, the four-team brackets in the CWS have been determined by the results of regional and super-regional play, much like the NCAA basketball tournament. Prior to 1999, the pairings for the CWS were not determined until after the completion of the regional tournaments. 2003–present – The championship final became a best-of-three series between the two four-team bracket winners, with games scheduled for Saturday, Sunday, and Monday evenings. In the results shown here, Score indicates the score of the championship game(s) only. In 2008, the start of the CWS was moved back one day, and an extra day of rest was added in between bracket play and the championship series. SCBA was Southern California Baseball Association (1977–84). Coastal Carolina won their 2016 CWS title as a member of the Big South Conference and less than 24 hours before officially joining the Sun Belt Conference. ↑ Known in 1950 as Colorado A&M. At the same time, "Colorado State" referred to Colorado State College, now known as the University of Northern Colorado. ↑ Prior to 1970, Northern Colorado was known as Colorado State College. Not to be confused with Colorado State University, known in 1950 as Colorado A&M. ↑ UTRGV, in full The University of Texas Rio Grande Valley, entered into full operation in 2015 following the merger of the University of Texas–Pan American (UTPA) and the University of Texas at Brownsville. UTRGV is credited with UTPA's College World Series appearance because the UTPA athletic program was directly transferred to the new institution. ↑ NCAA Trademarks – NCAA.org, footnote at bottom: "College World Series and Women's College World Series: The NCAA is the exclusive licensee of these marks, registered by Major League Baseball, in connection with the NCAA Division I Men's Baseball Championship and the Division I Women's Softball Championship." ↑ http://www.cwsomaha.com/press-releases/ncaa-signs-25-year-agreement-with-college-world-series-of-omaha-2.html NCAA Signs 25-Year Agreement with College World Series of Omaha, Inc.
1 2 3 "General CWS Records, All-Time Won-Lost by Conference, Pg 19" (PDF). NCAA.org. Retrieved June 12, 2016. ↑ "Coastal Carolina to join Sun Belt Conference in July 2016". Ncaa.com.